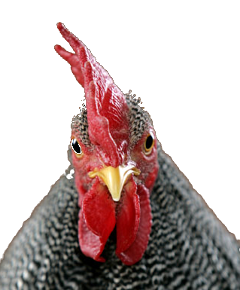 Yes, well… the chicken would like to say hello. Anyway, Broody lives on our homestead, along with six other chickens. Apart from all the poop, they are actually very good egg layers. We get maybe four or five eggs a day. And really, they are the best eggs! Yolks rich, creamy, deeply colored… Well, you’ll see. I decided to make a yummy breakfast, so looked around at what was on hand. 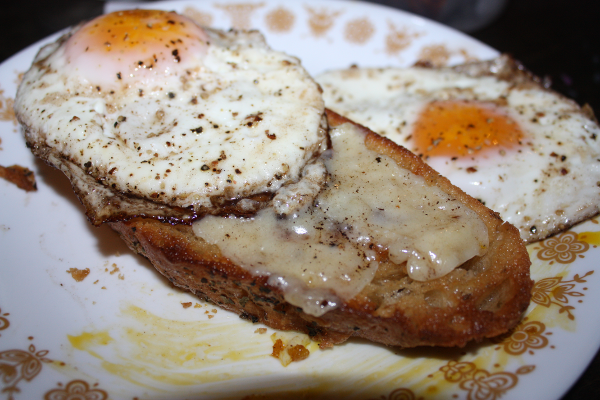 Focaccia bread… Some left-over Gruyere cheese… Of course, fresh eggs. Butter. The rest, as they say, wrote itself. Slice up the bread, get the butter ready to go, cut into 1 T segments, and slice up the Gruyere. Get the pan evenly hot, over medium heat. Add 1 T of the butter. Once melted, swirl it around, then add the bread slices. Swish those around to soak up all the butter, and fry until golden. Remove the bread, add another 1 T of butter, and return the bread to fry the other side. Add sliced Gruyere to the top of the bread while frying the second side. Once done, remove and set aside on a plate. Add the remaining 2 T of butter, let it melt and just start to brown. Add the eggs. If you want to be tricky, crack the eggs ahead of time into two cups. Then, with a cup in each hand, you can add all four eggs at once. Once the whites start to set, sprinkle with sale and pepper. Cover the pan, and lower the heat. Continue cooking until the sunny yolk starts to get white forming along its perimeter. Basically, you want all the whites done, but the yolk runny. 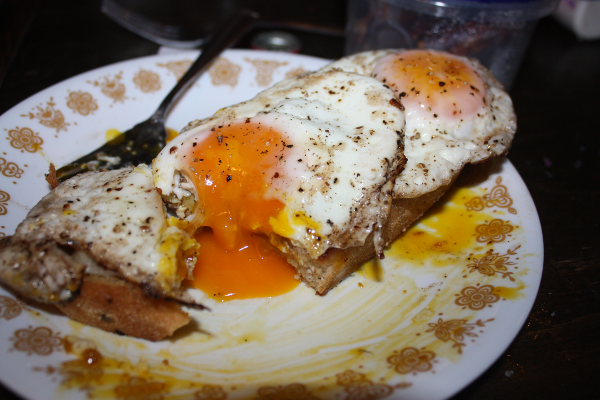 Remove the eggs and place two eggs on each slice of toast. Add a few dashes of hot sauce, if using. The combination of the creamy yolk, the crispy Focaccia, the velvety cheese… Oh, my! I’ve done this basic thing with lots of kinds of bread, but it wasn’t until I tried it with Focaccia that I wanted to write about it! You’ll notice only one assemblage in the photos… that’s because once I tried the first bite I knew two things: 1) I would have to finish that first piece right there, right then, and 2) I needed a photo record of the remaining piece so I could share it! Cheers! Yes, just let it sink in. Breakfast. On a rush-to-work day, my breakfast might be just a Chobani yogurt. Yummy, but… really? 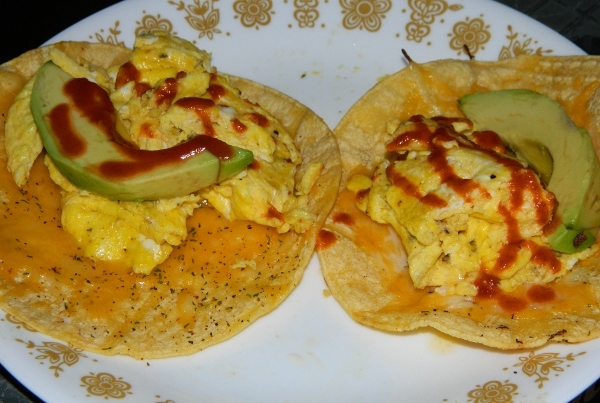 On the weekends, though, I like making a quick, tasty breakfast based on huevos rancheros, which I call Egg & Avocado Tacos. I am using super fresh eggs… literally, I go outside in the morning and fetch the eggs from our chickens! It is impossible to beat the flavor of eggs from happy, contented hens. We feed our chickens various fruit and veggie scraps, along with the occasional bits of barley. Otherwise, they free range about the homestead. In the winter, they get actual grain feed… which costs only about $12 for a 50 pound bag! If you have a little open space, raising a half-dozen egg-laying chickens is highly cost effective. And the eggs… yolks so dark yellow… so delicious! This recipe is what I make for myself. It ends up making four tacos. You may not eat like I do… in which case, either cook for friends & family, or make more, depending on how your appetite scales to mine! Beat the eggs & cream. Get a decent fry pan hot, on high. Add the oil. Once the oil is streaking in the pan, add the beaten eggs & cream. Let sit for a few moments until it begins to stiffen on the bottom. Then, with a wooden spatula, pull from outer edge in toward the center, gathering the scrambled egg in the middle of the pan. You can move the pan around to redistribute any remaining liquid egg/cream. After the first such “gathering to the center”, add salt & black pepper to taste (a couple pinches of salt, and 8-10 turns of the pepper mill are what I use) and the crushed red pepper. Stir it all together as you continue to pull cooked egg to the center. Don’t overcook! Scrambled eggs should still be somewhat damp (not runny) when they come out of the pan; they will continue cooking on their own as you heat the tortillas. Reduce heat to medium. Using the same pan, place two tortillas on the pan. Once the tortillas start to “bubble” and rise in a spot or two, turn over. Add cheese to tortilla, spreading more or less evenly. Just as the cheese melts, toss on a pinch of seasoned salt. Remove from pan when cheese is fully melted. Repeat with remaining two tortillas. To assemble the taco, take one tortilla, 1/4 of the scrambled eggs, and a slice of avocado. Drizzle on a bit of Sriracha sauce. Fold, eat, repeat! Accompany with a nice, strong coffee. Oh, you may wonder why there are only two tacos in the photo, when I said the recipe makes four… I did mention this was breakfast, right? These were the two still remaining by the time I found my camera!